Dr. Robert Hanlon, a board certified clinical neuropsychologist specializing in the forensic evaluation of violent criminal offenders, will speak at Southern Illinois University on April 30 at 6 p.m. in the Guyon Auditorium in Morris Library. Mass murders, including family mass murders and public mass murders in schools, shopping centers, theaters, etc. are commonly committed by mentally disordered young men. Dr. Hanlon will discuss recent findings regarding the psychological factors that contribute to homicidal aggression and murder. Based on his research and experience in evaluating hundreds of violent criminals, Hanlon will speak about how brain abnormalities and mental disorders, compounded by substance abuse, lead to the growing problem of mass murder in American culture. 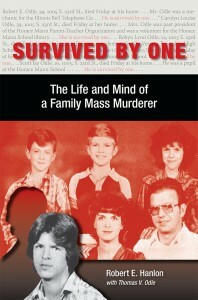 Hanlon is the author of Survived by One: The Life and Mind of a Family Mass Murderer, published recently by Southern Illinois University Press. Survived by One tells the story of Tom Odle, who brutally murdered his parents and three siblings in the small southern Illinois town of Mount Vernon, sending shockwaves throughout the nation. 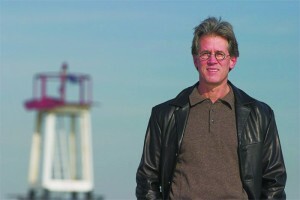 Hanlon tells a gripping story of Odle’s life as an abused child, the life experiences that formed his personality, and his tragic homicidal escalation to mass murder, seamlessly weaving into the narrative Odle’s unadorned reflections of his childhood, finding a new family on death row, and his belief in the powers of redemption. As our nation attempts to understand the continual mass murders occurring in the U.S., Hanlon sheds some light on the psychological aspects of why and how such acts of extreme carnage may occur. This entry was posted in Criminology, Regional, SIU by admin. Bookmark the permalink.